Peds vs. adult. Sometimes it makes a fundamental difference in diagnosis whether a patient is seen in a pediatric setting or by an adult specialist later in life. Here is the most recent example from our consortium, which was just published in Human Molecular Genetics: what initially looked like recessive inheritance with intellectual disability and a peculiar fever-associated epilepsy syndrome eventually turned out to be the second reported family of the novel spastic paraplegia gene AP4S1. This raises the question of how much we are missing if we are looking at the wrong point in time. Let’s have a look at how genetics can help us see an overlap of diseases where we usually don’t have a chance to. SPG52. Hereditary spastic paraplegia (HSP) is a progressive genetic neurological disease characterized by progressive lower extremity weakness and spasticity. Onset may occur at any time during life, but most cases of HSP manifest in adulthood. Accordingly, child neurologists rarely encounter these conditions and are therefore perplexed by the heterogeneity of the HSPs. To date, 72 types of HSP have been described and more than 50 types of HSP have been genetically characterized, easily matching the complexity of epilepsy genes. The different spastic paraplegias carry the designation SPG; the AP4S1 gene belongs to the SPG52 subtype. To put this into context: SPG52 is a very rare autosomal recessive complicated HSP, e.g. other clinical features are present. The most common HSP is SPG4 due to mutations in the spastin gene. The AP4S1 family. The family reported by Hardies and collaborators consisted of two affected sisters with simple febrile seizures starting in infancy and subsequent easily treatable focal seizures. Of note, with seizure onset, development of both girls plateaued after an initially normal development, eventually resulting in intellectual disability, axial hypotonia, and spastic diparesis. We initially included this family in our genome-sequencing effort for recessive epilepsies within the EuroEPINOMICS consortium. The discovery of compound heterozygous AP4S1 mutations, which were shown by the authors to disrupt protein function, was an unexpected twist, demonstrating the interconnectedness of neurological phenotypes. In other words, if we had taken off our epilepsy goggles and put on neuromuscular lenses, we might have seen that we were dealing with: a complicated HSP family. It is one of the consequences of genomic science that we have to face the data – and that we have to go where the data leads us. In this case, it leads us into the world of the hereditary spastic paraplegias. Sorting issue. AP4S1 codes for the sigma subunit of the AP4 complex, and mutations in other AP4 subunits are known to cause related phenotypes. 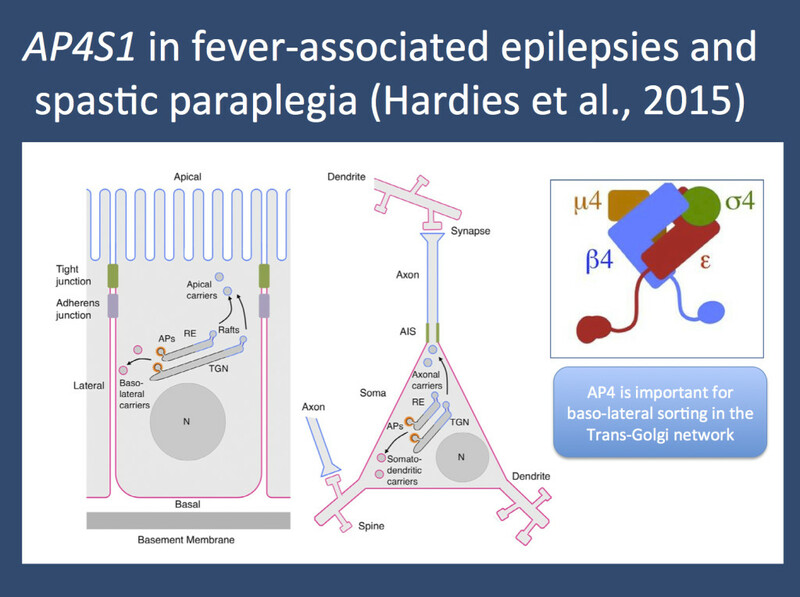 The role of the AP4 complex in polarized cells is crucial – it is important for sorting protein traffic in the trans-Golgi network to the basolateral membrane compartment. In order to illustrate this better, let’s take on step back: most cells, including simple epithelial cells or more complex cells such as neurons, are polarized. These cells have an apical compartment of their membrane and a basolateral compartment. In neurons, the apical compartment is the axon, while the basolateral compartment represents the cell body and the dendrites. Living cells need to make sure that proteins are delivered correctly to the respective compartments. Basically, you don’t want your synaptic vesicles ending up in dendrites or postsynaptic densities clogging the axons. In order to maintain this order, cells turn towards their logistics department, the Golgi apparatus. AP4 is one of the key components of this sorting process. If AP4 doesn’t work properly, it’s like an Amazon warehouse breaking down in the pre-Christmas season. Things don’t get delivered properly. Given the length of the axons of the corticospinal tract that are malfunctioning in HSP, it is understandable how defects in sorting may eventually impact on the survival of these neurons, leading to lower extremity weakness and spasticity. Genomics. The current publication by Hardies and collaborators is the first publication of the recessive epileptic encephalopathy project of the EuroEPINOMICS-RES project. To me, it is a great example of how we can proceed from interesting phenotypes in single families to gene findings and can subsequently put these findings into the appropriate context by joining forces with experts for the identified genes, in this case the Hirst lab in Cambridge. And finally, it is a good reminder that we should not be surprised at overlaps between seemingly unrelated neurological disorders even though we didn’t expect it to start with. I didn’t really expect that I would be writing about the hereditary spastic paraplegias at some point on this blog. This entry was posted in 2015, Epileptic encephalopathy, EuroEPINOMICS, Familial epilepsies, Papers and tagged adaptor protein 4, AP4, atlastin, Dravet Syndrome, epileptic encephalopathy, family sequencing, genome sequencing, Golgi network, hereditary spastic paraplegia, HSP, neurodegenerative disorders, recessive epilepsies, spastin, SPG3A, SPG4, SPG52, strumpellin. Bookmark the permalink.